Regarding the order in time, Alessandro Balossi is the last photographer entered in the Italian Lakes Wedding team. Although personally I know him very well – as i had the opportunity to work with him for numerous weddings , for the occasion of his official presentation I’ve asked him to write few words about himself. I supposed that it’s a “mission impossible” being Alessandro a quite shy and reserved guy… In fact, it wasn’t easy, but at the end he could manage to give me a short text, that – I think – describes perfectly his personality and the way of interpreting the world of wedding photography. “I love the images of the smiling brides, shot spontaneously at the moment, catching the real happiness of that day without any pretence in rigid poses and fake expressions of the face. I like to give a dynamic cut to the photos of my weddings, inspired by the most actual fashion images. I love to catch details and moments to create a real reportage of that very unique and special day. Above of all, I like to “stop” in time those particular expressions and situations that are lived absent-mindly on the big day amongst all the emotions, so I can show and revive them again with the bride and groom in my studio later on”. 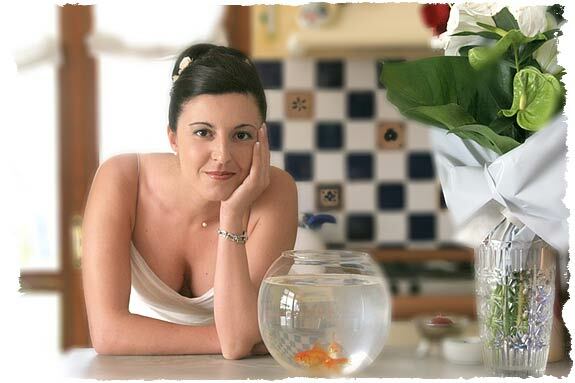 In fact, this is absolutely true: Alessandro Balossi is the photographer of the smiling brides! It’s enough to see his photo gallery to understand this. But what strikes the most, is the absolute spontaneity and naturalness of the photos, despite the fact that majority of them shows portraiture images. Alessandro in fact was “grown” as fashion photographer and has a consolidated long experience behind: this for sure helped a lot his carrier as a wedding photographer. The portraits of his brides and grooms seems really natural, without any camouflage like if they would have been seized upon. The trick of Alessandro is simple: all is based on his relaxed and calm approach as he works, like in front of the fashion models making feel the brides very special and at ease. His enchanting, almost tender way of acting has the power to create a kind of complicity between the bride and the photographer: this translates then in joyful, but natural expressions, with freedom and spontaneity. From this point of view, my opinion is that Alessandro Balossi is one of the best portraiture style wedding photographer of the Italian Lakes area. A hearty welcome in our group to Alessandro Balossi from all the team of Italian Lakes Wedding, with all the best wishes of good job and many many marvellous photos of smiling brides!